Connor Christian (right) accepts bSI award. Omaha, Neb. — buildingSMART International named HDR the winner in its “Operation and Maintenance Using Open Technology” category for the database HDR created for the Governor Mario M. Cuomo Bridge in New York. Connor Christian, HDR’s director of digital implementation services, accepted the award at the awards ceremony in London, United Kingdom. The 3.1-mile-long twin-span Mario Cuomo Bridge is replacing the Tappan Zee Bridge crossing over the Hudson River, located less than 20 miles north of New York City. Project requirements included creating an as-built crossing database for maintenance and planning, which meant connecting different software models of drawings, certifications, reports, photos and other data. The database also needed to be capable of connecting operations and maintenance data throughout the bridge’s life cycle. To date, the database has created more than 400,000 automatic data connections and the team estimates there will be more than a million connections made by the end of the project. “To connect these data elements manually would take staff roughly 11 years,” Christian said. 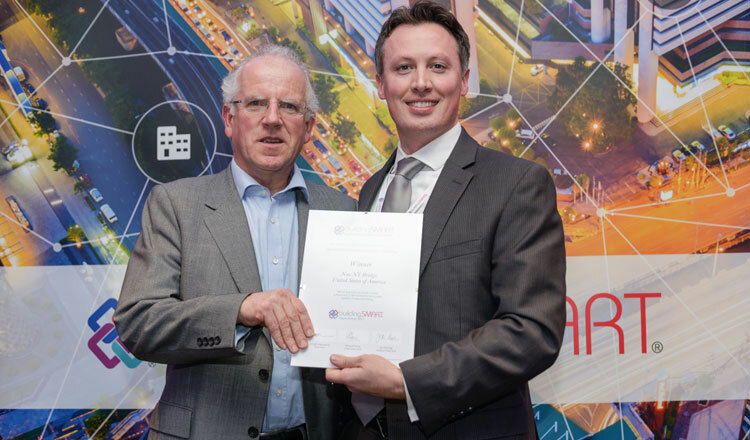 The buildingSMART International Awards recognize projects that demonstrate and inspire the use of open standards developed by the buildingSMART International community to overcome interoperability challenges in the industry. “The open-technology database was the right solution for the Mario M. Cuomo Bridge because it allowed efficient organization of vast amounts of design and construction-related data, and provides an adaptable long-term maintenance environment for the owner,” said Jeff Han, HDR principal project manager, Bridges & Structures.